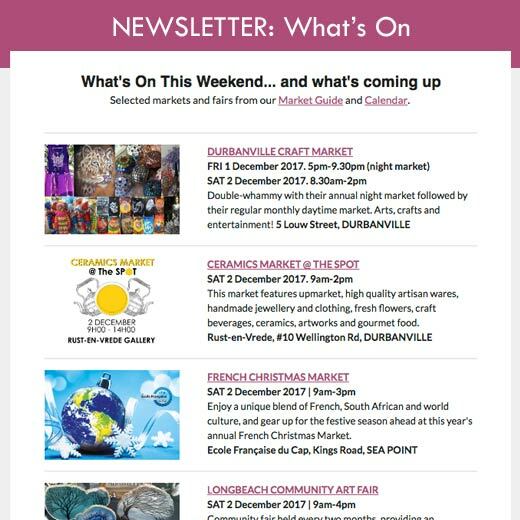 Simply South is an Indoor Gift and Craft Fair situated on the premises of the NG Kerk in Bergvliet, (at the circle in Ladies Mile Road). The market runs from the 3rd December to 22nd December 2018. Just in time to find that unique gift for friends and family and, of course, why not you too! Featuring over 200 crafters from all over the Peninsula this event is a shopper’s delight, full of inspirational ideas and handpicked innovative products – a celebration of gifts with a difference. Entrance is free with plenty of parking available. Stalls include toys, home decor including aluminium homeware and a unique range of handmade cutlery. For the food lovers there is an extravagant array of mouth-watering and unique food gifts, a variety of sauces, jams, olives, biscuits, dried fruit and nuts, Christmas cakes, fudge and other yummy goodies. There will be a range of beautifully presented sweets and toffees which make an ideal gift for the ‘sweet toothed’ someone. Tea room will be available for light snacks for the duration of the market. Crafters offer gorgeous must-have pottery, glassware, children’s clothing, plants, jewellery, fabric crafts, wood crafts, stationery, cards and paper products, beadwork, natural body and health products and a variety of other handmade crafts. The market runs daily. A raffle will run for the duration of the market and the proceeds thereof will be donated to Imbali. Credit card, debit card and Snap scan facilities are available. Cnr Ladies Mile Road and Firgrove Road, Bergvliet.